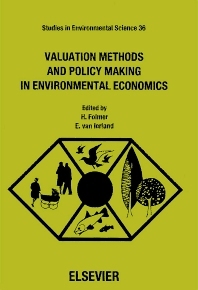 Valuation methods and policy making in environmental economics: relevance and scope (H. Folmer, E. van Ierland). Part I. The Valuation of Public Goods. 2. Non-market asset prices: a comparison of three valuation approaches (R.C. d'Arge, J.F. Shogren). 3. Valuing public goods in a risky world: an experiment (P.-O. Johansson). 4. Recreational values, pareto optimality and timber supply (P.-O. Johansson, K.-G. Löfgren, K.-G. Mäler). 5. Estimating social benefits of environmental improvements from reduced acid rain deposition: a contingent valuation survey (S. Navrud). Part II. The Valuation of Health and Life. 6. Benefits of reduced morbidity from air pollution control: a survey (M. Dickie, S. Gerking). 7. Valuing a public good: direct and indirect valuation approaches to the measurement of the benefits from air pollution abatement (M. Shechter, M. Kim, L. Golan). 8. Environmental regulation and the valuation of life: interindustry mobility and the market price of safety (H.W. Herzog Jr., A.M. Schlottmann). Part III. Cost Benefit Analysis. 9. Disequilibrium cost benefit rules: an exposition and extension (P.-O. Johansson, K.-G. Löfgren). 10. Macroeconomic cost benefit analysis of environmental programmes (A. Nentjes). Part IV. Aspects of Policy Making. 11. Benefit estimation for complex policies (A. Randall, J. Hoehn). 12. The acid rain game (K.-G. Mäler). Index. This volume considers, in depth, some valuation methods and aspects of cost benefit analysis, and policy making in environmental economics. Part I contains a number of contingent valuation studies for non-market assets. Part II consists of contributions on the valuation of health and life, and deals with the benefits of reduced morbidity from air pollution control. In Part III, cost benefit analysis for environmental policy-making is discussed in a disequilibrium setting, and in a macroeconomic context. Finally, Part IV deals with aspects of policy-making, particularly benefit estimation for complex policies, and the international aspects of transboundary air pollution in Europe. The book should not only appeal to students and researchers in university departments of economics and environmental sciences'' but also to those working in public organisations and associated advisory institutes which are concerned with environmental problems.